Upcoming events, dialogues, and demonstrations. ​How do biologists, hydrologists, ecologists, and other natural scientists develop practices toward environmental justice? What queer, ecological theories can assist practices --cultural and material--that center social justice in the sciences? 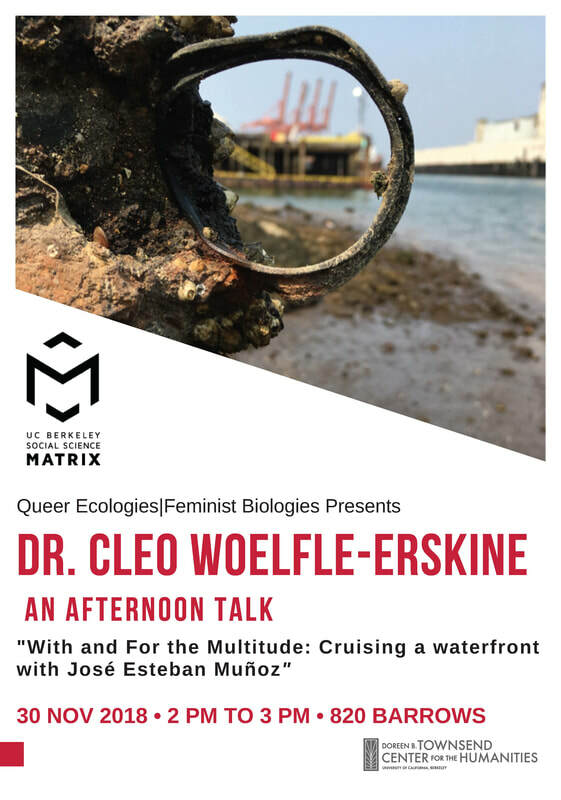 The Queer Ecologies|Feminist Biologies Collaboration is thrilled to host Dr. Cleo Woelfle-Erskine to present some of his current work investigating these questions and themes. From 2:00-3:00pm at the UC Berkeley Social Science Matrix, in 820 Barrows Hall. The Graduate Diversity Council (ESPM, UC Berkeley) and the Multicultural Center (MCC) present Afrofuturism: Visions of a Black Green City! Inspired by C.N.E Corbin's article titled: Wakanda! Take the Wheel! 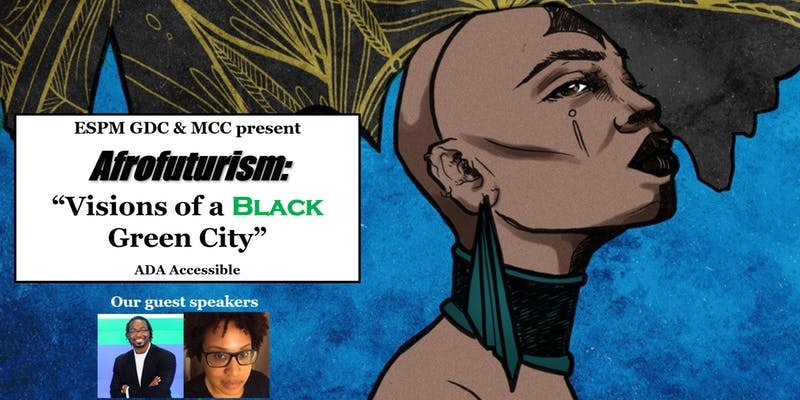 Visions of a Black Green City, we are holding a discussion on AFRO-FUTURISM with C.N.E.Corbin and Kalimah A. Priforce. ​The Queer Ecologies|Feminist Biologies Collaboration has our first public event on Nov. 5th at The Social Science Matrix at UC Berkeley. Panelists will converse openly about personal pathways, opportunities, & obstacles to disrupting and (re)thinking sciences in practice & publication. Our collaboration is interdisciplinary: This panel is designed for an interdisciplinary audience. Please spread the word and join us from 5:00-6:30pm on Nov 5th, 820 Barrows Hall! How can we use diverse and porous archives to trace the bureaucratic machinations of empire, settler colonialism, and white supremacy? How are technological instruments continuously remade as "apolitical"? Across land, health, and bodily senses, how do contend with--and leverage(?) toward disruptive ends--the affective embodiments of political power asymmetries? These questions emerged from our research on toxicology, property law and mapping, sonar, and fracking. Collectively, our approaches to understanding the uneven distribution of harm--especially along the lines of race and geography--were always spatial and historical. And also rife with resistance. Push-back on the "post." ​From January 26th-28th, 2018--at the University of California, Berkeley--we Left Coast Political Ecology Network organizers will be facilitating a 2-day workshop to address the question of political ecology’s responsibility in the present moment. In this workshop we aim to engender conversations around political ecology’s (PE’s) current engagements with racism and colonialism, as well as how we might strengthen our work toward anti-capitalist and anti-fascist ends. These questions are also methodological. The weekend will include workshops on research methods that help us extend our work with non-academic communities and develop tools for critical ethnography and participatory research. We hope to cultivate a collective dialogue among West coast scholars at all stages of their careers, as well as to provide opportunities for new collaborations and senior-junior mentorships to grow. Our aim is to gather an intimate group for a two-day workshop aimed at building our own internal networks, and building out towards future collaboration and cross-pollination. We hope people will come away from this event with new directions or stronger convictions of existing paths in their own PE research and/or activism. We hope for an invigorating weekend together. 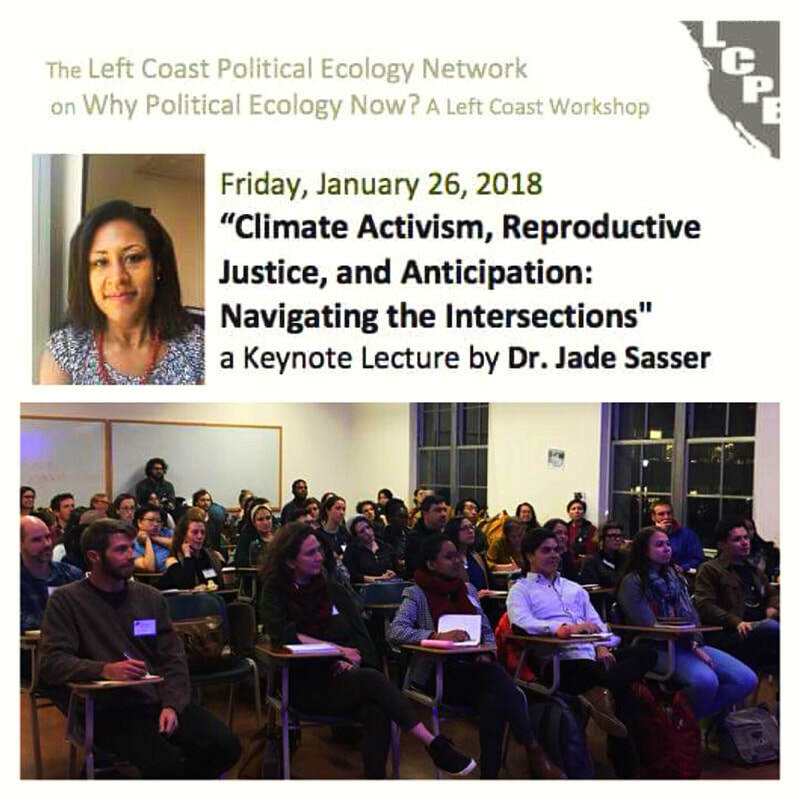 The workshop will feature a keynote talk by ESPM alumna Dr. Jade Sasser, “Climate Activism, Reproductive Justice, and Anticipation: Navigating the Intersections,” followed by a Q&A, from 6:30-7:30 pm on Friday, January 26, 2018. Please consider joining us: Registration is open here. ​​I am pleased to be co-organizing Technopolitics and Empire: New Directions in Science Studies in collaboration with Kathleen Gutierrez (PhD Candidate in South and South East Asian Studies) and Angelo Caglioti (Max Weber Fellow, European University Institute). This day-long workshop is hosted by the Center for Science, Technology, Medicine, and Society at UC Berkeley on Thursday, November 2nd, 2017. This workshop offers graduate students and faculty an opportunity to share current research and to envision new directions in science and (neo-)empire studies. 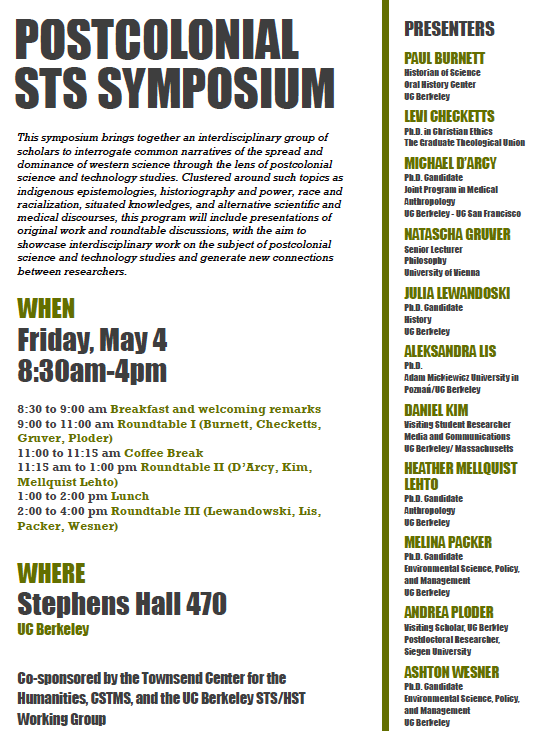 Faculty, graduate students, and community members interested in cultural, social, and humanistic understandings of science, technology, environment, and empire are encouraged to attend. Please RSVP here. I look forward to presenting new work on drone technology, conservation politics, and militarism–as well as offering closing remarks. Most importantly, I’m excited to generate incisive discussion and inquiry with invited faculty (Professors Jennifer Derr, Suzanne Moon,Gabrielle Hecht, and Diana K. Davis) and student collaborators tomorrow (Kathleen Gutierrez and Jennifer Duque, PhD Candidate in Ethnic Studies). We are also lucky to be guided by questions and insights from invited discussants Julie Pyatt (PhD Candidate in ESPM, UC Berkeley) and Camilla Hawthorne (PhD Candidate in Geography, ESPM). I hope to further the depth and registers of one of my dissertation chapters on Bio-Surveillance Technology in the Settler Colonial Pacific Northwest U.S.